Persistence Market Research forecasts that the global biochemistry analyzers market is poised to grow from nearly US$ 3,200 Mn in the year 2017 to about US$ 4,700 Mn by the end of 2024. This represents a CAGR of 5.5% over the forecast period. 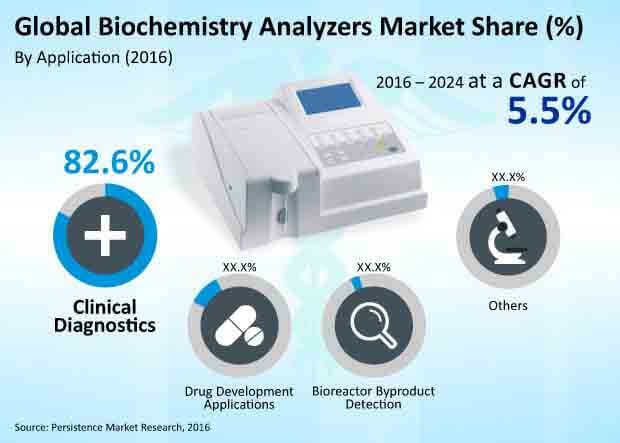 The global market for biochemistry analyzers represents an incremental dollar opportunity of nearly US$ 1,500 Mn between 2016 and 2024. In India, the recent decision to reduce stent prices by 85% has set a new healthcare benchmark in the medical parlance. On similar lines, in an effort to reduce the price burden for people who spend a hefty amount of money on medical tests, 45 diagnostic laboratories in Bangalore city have come under one umbrella. This massive collaboration will reduce the price of many diagnostics tests by 40% on an average. The organization is named Association of Diagnostic Centers – Bengaluru. The association has till now published a list of 26 tests comparing the current test prices with the reduced prices. However, in this city, only 50 of the 1,000 odd laboratories possessed high-end equipment. Currently, there is no mechanism in place to check prices that laboratories charge and this new initiative may be able to bridge the gap in the prices that are prevalent in different laboratories. Manufacturers are developing biochemistry analyzers with multiplexing analyzers. Such type of analyzers possess the feature of positive identification that reduces the process of repeated pathogen testing. This becomes a critical feature in cases of samples that have low volume such as neonatal units. This type of system with shorter turnaround time gives advantages of high clarity and result accuracy. The feature of positive identification helps acquire accurate results in shorter run time by avoiding the inclusion of too many targets. On the other hand, besides pathogen testing, biochemistry analyzers are used for drug monitoring, drug abuse detection and many more applications. Due to such technological advancements in the field of professional diagnostics, the applications of biochemistry analyzers that were initially restricted to the detection of infectious diseases are now venturing into other areas as well. As a result of this technological evolution, the diagnostics tests are now witnessing a boost in their demand. Initially, biochemistry analyzers were used for repetitive analysis that consumed a lot of reagents. This has now changed and due to the replacement by discrete working systems, low volume reagents are now being used. The new instruments are able to automate repetitive sample analysis steps that would have otherwise been done manually by a lab technician. Moreover, as a result of the convergence of system engineering, automation and IT technology, a significant change has been brought in the global biochemistry analyzers market. The use of ELISAs for clinical testing within a laboratory is time consuming and demands more personnel and resources. However, moving from ELISA technique to an automated biochemistry method increases time and personnel efficiency considerably, and this leads to cost effectiveness as well. The Clinical Diagnostics application segment dominated the global biochemistry analyzers market in revenue terms in 2015 and is projected to continue to do so throughout the forecast period. Clinical Diagnostics is the most attractive segment, with a market attractiveness index of 3.5 during the forecast period. The Drug Development Applications segment is forecast to be the second most lucrative segment in the global biochemistry analyzers market, with an attractiveness index of 0.4 during the forecast period. The Bioreactor Byproduct Detection segment is anticipated to be the least attractive segment in the global biochemistry analyzers market, recording an attractiveness index of 0.1 during the forecast period. As per the World Health Organization, in the year 2014, 65% of patients with suspected malaria cases in public health facilities in the WHO African region received a diagnostic test, as compared to just 41% in the year 2010. This example underscores the increase in the sample load on diagnostic labs. In addition, the percentage of the population that is insured is high as compared to previous years. This has also driven the need for more labs and automated systems. Moreover, the potential offered by medical diagnostics has attracted a number of private players. For example in India, there are around one lakh diagnostic labs. The newly operating labs are installing automatic systems to handle higher sample load with accurate results. Due to a rise in the disposable income, the number of people with insurance has also increased, giving them accessibility to private labs that have high-end diagnostic instruments.